A wildfire that began in Ein Hemed, outside Jerusalem, spread to the town of Mevasseret Tzion. It's another suspicious blaze. A suspicious wildfire that began near the Ein Hemed national park outside of Jerusalem quickly spread in the sweltering heat Sunday afternoon. Six firefighting aircraft and at least 21 crews of firefighters have been required to contend with the inferno, with more being recruited. The blaze was said to be under control by early evening. At least two people have been treated for light injuries from smoke inhalation, and one firefighter has fallen from a ladder. The blaze has consumed numerous acres of forest land in the hills surrounding Jerusalem and leading down to Tel Aviv. It also forced officials to close the Jerusalem-Tel Aviv highway for a short time, as the flames neared the road, presenting a danger to motorists passing by. It began early in the afternoon, and has continued to spread due to the dry air and high temperatures, which have hovered around 40 degrees Centigrade (104 degrees Fahrenheit). A number of residents were evacuated from Ein Hemed as the flames neared their homes. By the mid-to-late afternoon hours, the fire began to spread towards the city of Mevasseret Zion. Residents of that town began to be evacuated as the flames crept towards their homes as well. Magen David Adom emergency services in Jerusalem declared a raised alert level to deal with casualties from the fire, if necessary. Police and firefighters have opened an investigation into the cause of the fire. In the past several weeks, hundreds of fires in the Jerusalem area were ignited by Arab arsonists, including a very large blaze not far from the site of the Ein Hemed flames. 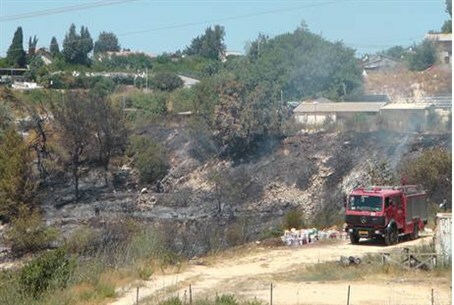 Several arrests have already been made in connection with those fires, including two suspects, ages 17 and 18, residents of the Palestinian Authority village of Kfar Katna.